Okay, I’ve been storing up so many events and resources to post about, I’d better get them all down in a post. I’m sure I’m missing a few I meant to include, so I’ll post again if and when I find them. The Eat Local Now! collaborative is putting on the annual Eat Local Now celebration dinner! This is a great event and supports a group strengthening and promoting sustainable food systems in Cascadia. You can buy tickets here. This vibrant and successful fundraising dinner celebrates involvement in and cultivation of our local food economy. We advocate for access to locally grown foods for all income and social groups and seek to strengthen the local food economy by supporting local food businesses. The Eat Local Now! Dinner offers a vital community space for individuals to share their stories, time for food and garden inspired activities, and a delicious community dinner featuring fresh food grown or produced in Washington, prepared by inspired local chefs. The University of Washington is offering a remarkable series of lectures about food this quarter. Open to the public, UW students can also take these for UW credit. Tuesday nights at 6:30, Kane Hall, starting October 5th. Don’t miss this. I caved and created a Twitter feed. It’s http://twitter.com/sealocalfood . I kind of hate Twitter, but I know some people like it. Do people just find my feed on their own? I don’t really understand this crazy interwebs business, apparently. SLICE ( Strengthening Local Independent Cooperatives Everywhere) is our region’s 2nd annual cooperative business conference. If you’re currently part of a co-op business, are starting one, or just want to learn more about how the co-op business model can help build an economy that is more just and economically sustainable, this conference is for you! Co-presented by Central Co-op and Seattle Good Business Network, the conference will feature national and regional speakers, workshops, and great food! Details and tickets at slice.coop. Great news from Urban Farm Hub about the City of Seattle’s Atlantic City Nursery site. It seems the Parks Board Commissioners have agreed that future use of the site should include urban agriculture. It’s been a good year for Seattle’s process of becoming more urban-farm-friendly! On September 25th and 26th, the Pike Place Market Foundation will host the first annual Pike Place Market Artisan Food Festival. Hours will be 10:00 AM to 6:00 PM Saturday and 10:00 – 5:00 Sunday. The 2010 Artisan Food Festival will be modeled after Salone Del Gusto, the popular festival in Torino, Italy and feature outdoor ‘pavilions’ with the following themes: beer, wine, bread & cheese, coffee & tea, meat, chocolate, vegetables, sustainability, and crafts. It will also feature chef demonstrations, live music, children’s activities, and beer and wine gardens – something for all interests and ages. The Festival is produced by the Market Foundation. Proceeds will benefit the low-income clients who rely on the Market’s four human service agencies – the Clinic, Preschool, Senior Center, and Food Bank. 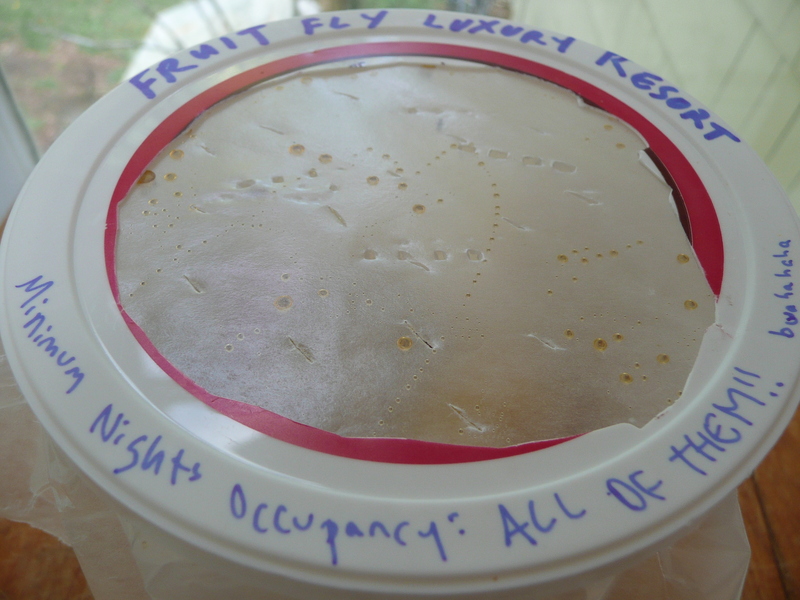 I attended the Hazon Food Conference last year. Hazon is an organization dedicated to making a healthier and more sustainable Jewish community and world overall. 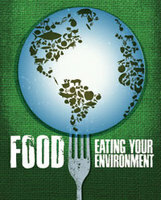 They focus largely on sustainable food. Their conference this year looks interesting and worthwhile; check it out, if the intersection of Jewish culture and sustainability is something important to you. 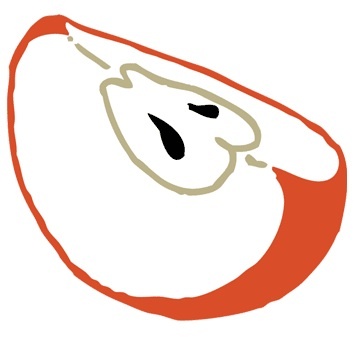 [From their website] The Hazon Food Conference is a unique gathering that will bring together 200 professionals, lay leaders, and foodies to connect, collaborate, and continue to build the New Jewish Food Movement. The Conference will provide in-depth sessions that willstrengthen and expand participants’ knowledge of Jewish thought on food, agriculture, and consumption, as well as opportunities to build community with regional cohorts and professionals of similar backgrounds. Blog Ad FAIL… Insidious, Funny, or Both? Updated to add: Thanks to Laura for the screen shot! So, I had no idea that Google ads appear at the bottom of my blog. I’m fairly new to WordPress, and I use Adblock on my web browsers. I guess it’s how WordPress makes money. 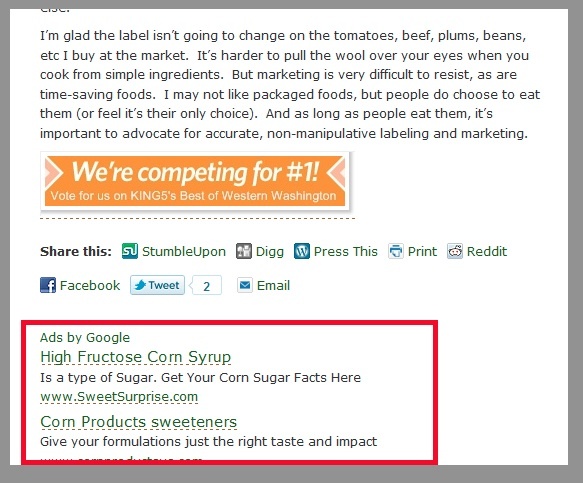 Reader Laura cracked up when she got to the end of my last post (about high fructose corn syrup changing its name) and found one of the Google ads was from the Sweet Surprise people themselves! Oy. I don’t think they’re going to get any business off this blog, somehow. I can’t decide if this is creepy or hilarious. Probably both. If any of you saw this too let me know! Sometimes, I’d rather not be right. Years ago, I wrote a blog entry about how manipulatively renaming detrimental ingredients can trick consumers into eating things they don’t want. I was thinking about the term “organic evaporated cane juice” and how it’s simply a way to encourage people to eat sugar who might otherwise hesitate. I suggested that, while we’re at it, why not rename high fructose corn syrup something like fructose-infused zea mays nectar? Make softly lit ads with kittens and puppies getting along? A few months later, the Corn Refiners Association began their infamous Sweet Surprise campaign, and I thought my prediction had come true. No kittens and puppies, but pictures of (healthy, happy, multiracial) children getting along while eating popsicles. Now, they’ve taken my original advice. The CRA has petitioned the FDA to get “corn sugar” approved as the new term. 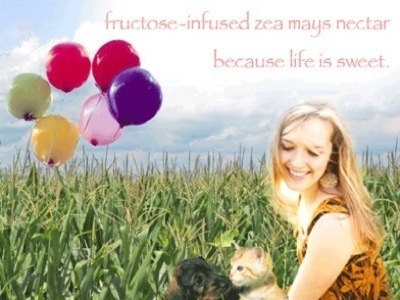 (Was fructose-infused zea mays nectar to long? Sorry about that!). No sugar is good for you, although I choose to have a little now and then for the sake of occasional baked goods. But HFCS is extra bad. It plays a role in obesity, sure, but it seems specifically to induce symptoms of metabolic syndrom (fatty liver, insulin resistance, hypertension, heart disease…) even without obesity. This is pretty insidious. The only reason to make the change is that people are making specific, conscious choices not to eat the stuff. A name change will trick people into eating what they don’t want. That kind of manipulation is responsible for a whole lot of unhealthy eating in this country. I was listening to a call-in show on NPR not too long ago, hearing some guy rant about how insurance shouldn’t cover anything to do with metabolic disease and obesity because people “make bad choices.” That kind of attitude is maddening in a world where these sorts of marketing manipulations happen all the time. The name change is creepy. But on the other hand, maybe people are catching on to the constant swapping of names and hiding of ingredients. Since all sugar has detrimental metabolic effects, wouldn’t it be nice if any kind of sugar on the label made people hesitate as long as “high fructose corn syrup” tends to? But then, manufacturers would probably just switch the name to something else. I’m glad the label isn’t going to change on the tomatoes, beef, plums, beans, etc I buy at the market. It’s harder to pull the wool over your eyes when you cook from simple ingredients. But marketing is very difficult to resist, as are time-saving foods. I may not like packaged foods, but people do choose to eat them (or feel it’s their only choice). And as long as people eat them, it’s important to advocate for accurate, non-manipulative labeling and marketing. ~ How small-farm eggs are more nutritious overall. So, you know there are lots of reasons to eat eggs, other than that they’re cheap and delicious. And that anyone trying to tell you eggs are bad for you is misguided. Today, we’re highlighting instead the versatility of the humble and delicious fried egg. Sure, fried eggs are great for breakfast and brunch. On top of some smoked-paprika home fries with vegetables (hmm, maybe I should give you that recipe) and with a side of greens or breakfast sausage, they’re one of my favorite things to eat. But you’ve probably noticed I stick fried or poached eggs on top of a lot of my dishes. The spring vegetable gratin. The Thai basil chicken. The rice bowl with ikura (salmon eggs) and vegetables. It’s gotten me thinking: What wouldn’t be better with a fried egg or two on top? Probably most desserts. Fruit would be pretty weird. Um… I’m having trouble thinking of other examples. Meats? Delicious. Rice dishes? Absorb the egg yolk — yum! Slow-cooked or lightly cooked vegetables? Yes. French fries, of course: cooked in beef fat and dipped in the broken yolk of an egg. A salad? Actually, yes. Pizza? 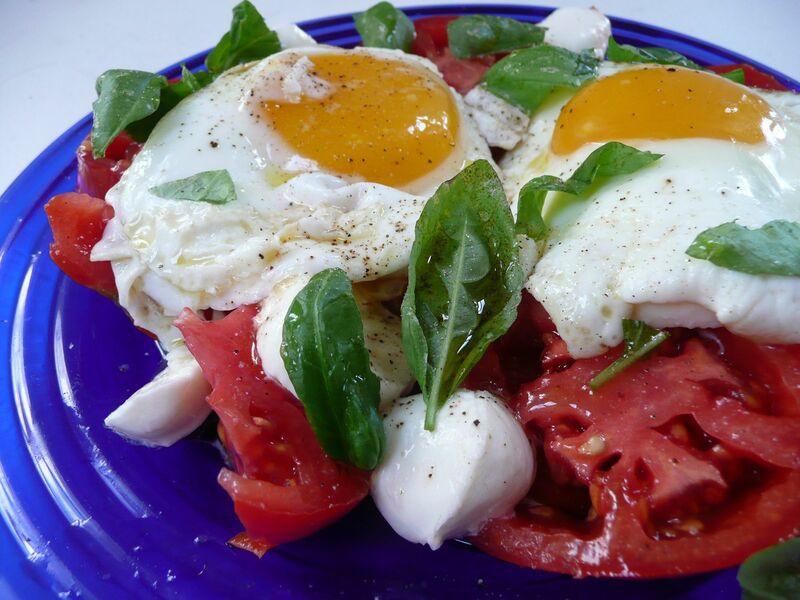 Egg is a classic addition in Italy, as it is on meaty pasta dishes. Thai food? Very traditional to add a fried egg on top; my college cafeteria in Chiang Mai had a tray of them ready to toss on for 5 baht more. What about soup? Poach it right into the soup and break the yolk as you eat to thicken the broth. In some of these cases, the egg might feel like overkill, but in many it’s a great addition. And you get some more good fat and vitamins in your meal, along with that extra quick-to-make deliciousness. 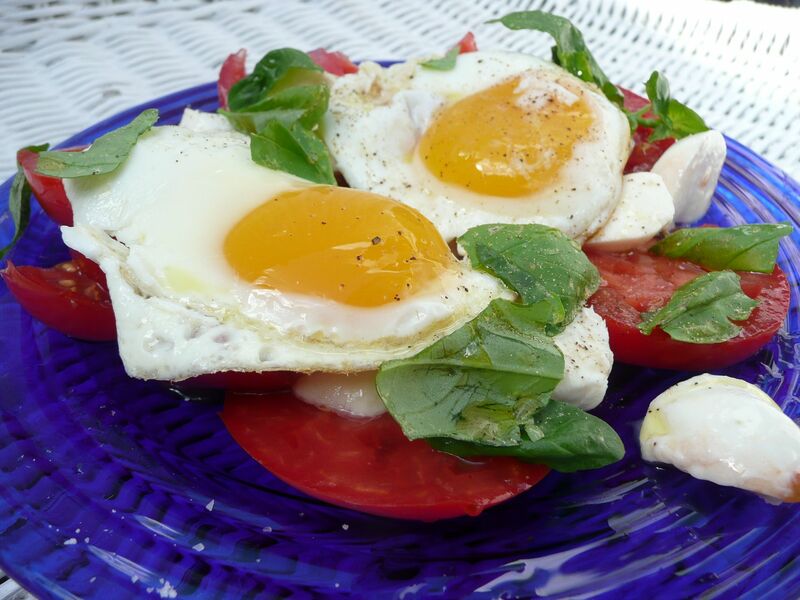 I took the classic caprese salad (tomato, mozzarella, basil) and added some fresh eggs from our house’s new chickens (check out those nice orange yolks!). So tasty. 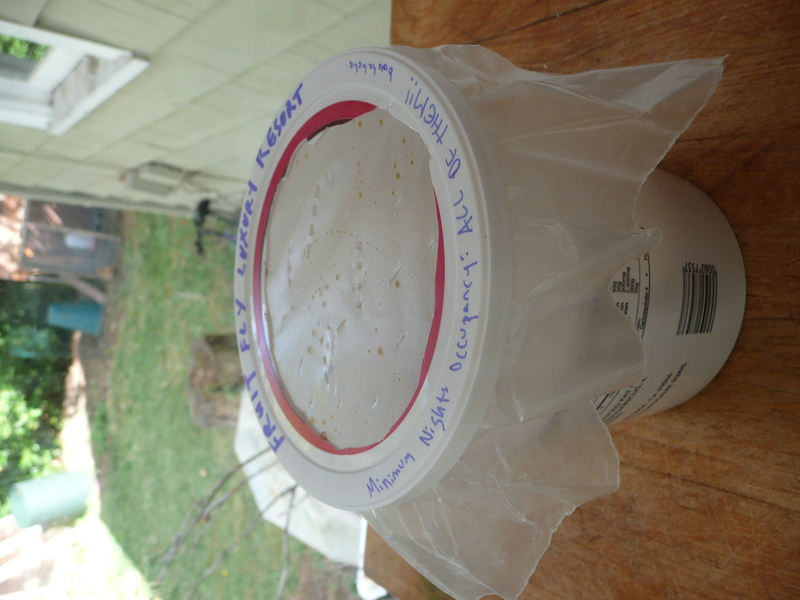 You can even make your own mozzarella if you’re feeling so compelled (instructions here). Okay. I want your ideas. What else unexpected is made better with an egg on top? What else would be spectacularly weird? 3. Drizzle with olive oil and vinegar. Sprinkle on salt. 4. Fry eggs in butter, letting yolks stay runny if you like to. A tip: sprinkle a spoonful or two of water into the pan when the eggs are halfway cooked and cover immediately. Helps the whites cook fully and not burn. Take off the heat fairly soon after. 5. Add eggs to salad. Tear basil leaves on top and grate pepper over the whole thing. Serve immediately. 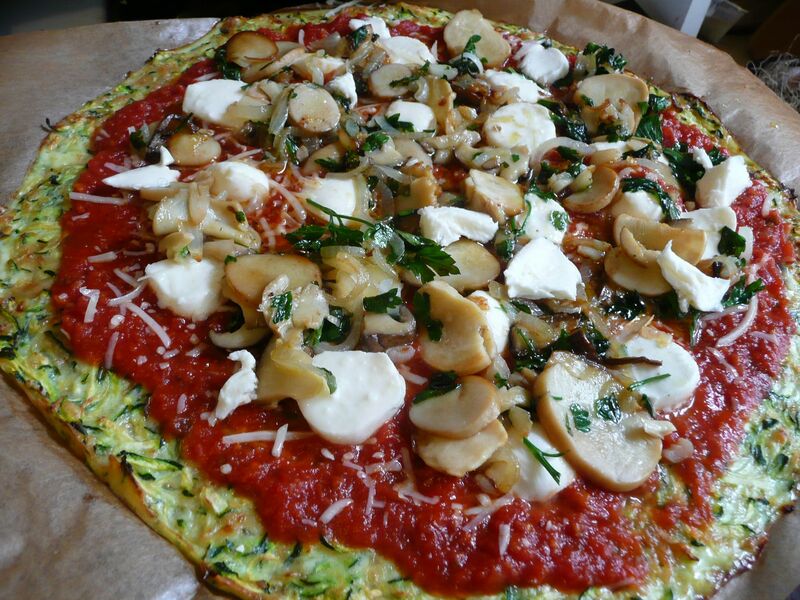 When I wrote about cauliflower crust pizza, reader Sarah tipped me off on the Seattle Local Food Facebook page to another idea: zucchini crust. Apparently it’s a trick she learned from her grandmother. Grandmother-approved and grain-free? I had to check it out. 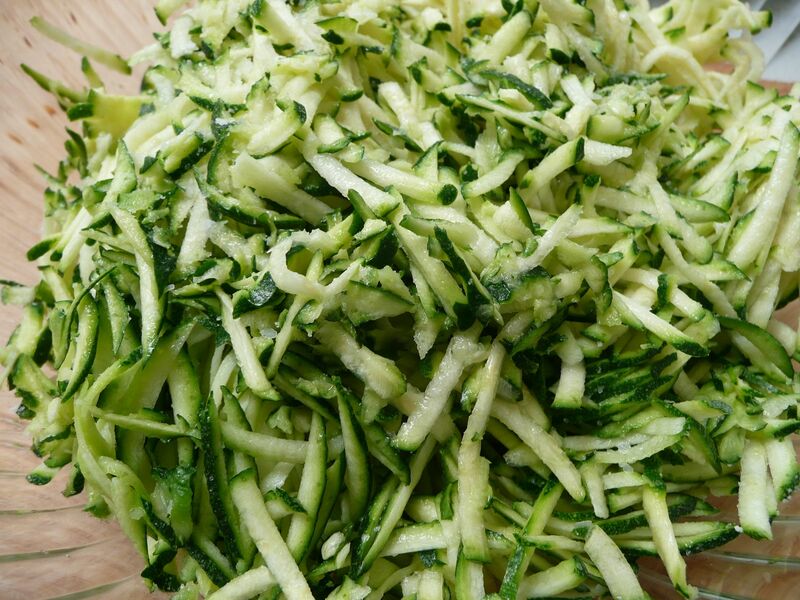 If it was as delicious as it sounded, it could be the ultimate cure for too-much-zucchini season. 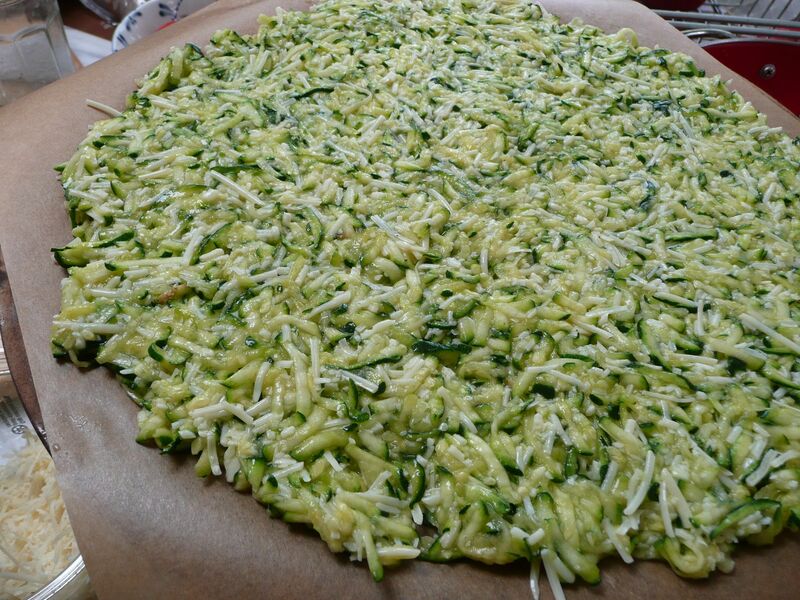 It works just like the cauliflower crust, only you pre-shred the zucchini raw, and drain out its excess liquid, whereas you mash the cauliflower after cooking it. If you have a food processor with a top shredding blade, assembling this crust is fast and easy. The whole pizza-making process is actually pretty quick. The result is a thinner crust than the cauliflower, with a nice chewiness. A wetter topping such as tomato sauce can make it a bit soggy, but tastes so good that I don’t mind. Pesto works really well too. I used some of the nettle pesto from my freezer on one pizza. Delicious. The pizza above has tomato sauce, fresh mozzarella, extra parmesan, fresh yellow tomatoes added at the end, and a sauté of garlic, onion, Italian parsley, and king oyster mushrooms. Any mushrooms will do. 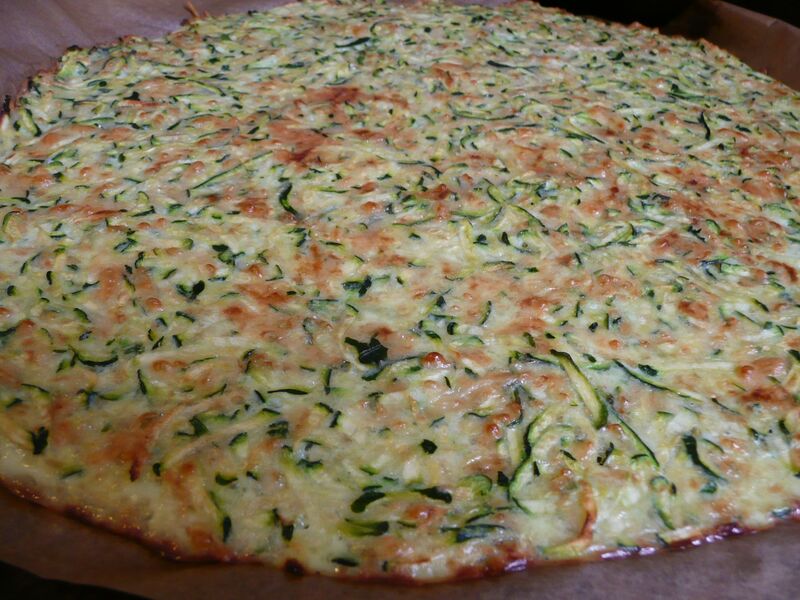 About the crust proportions: You can really vary them, as long as there is enough egg to bind the other ingredients together, enough cheese to brown, and enough zucchini (with water squeezed out) to give it character. More cheese will make a crispier, browner crust. Okay, too-much-zucchini season: Bring it on. My toppings are ready. See note above about how you can vary these proportions according to your taste, your desired crispiness, etc. 3. Sprinkle salt on the zucchini and stir. Let it sit a few minutes. 4. Squeeze the water out. 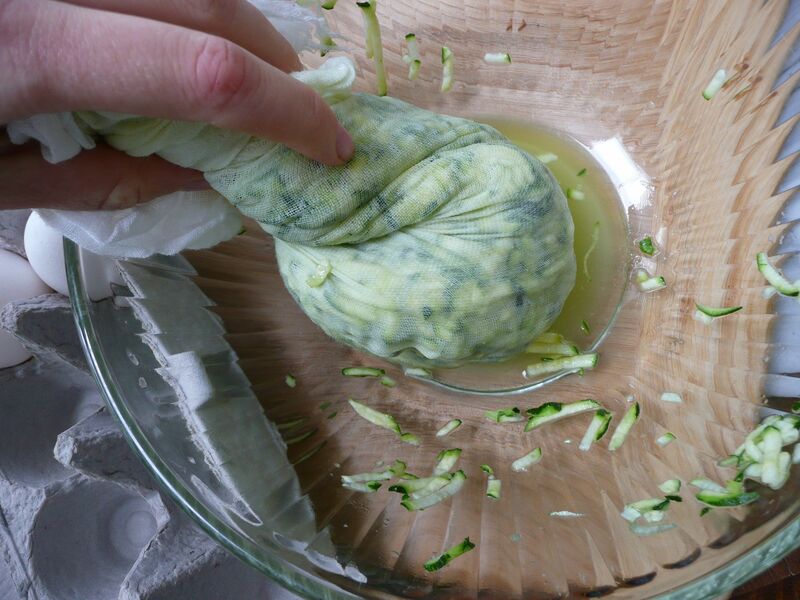 I found the easiest way to do this was to wrap it in cheese cloth or butter muslin and squeeze. You can also put the zucchini on one plate and press another plate on top of it, or put it in a colander and press a bowl into it. 5. 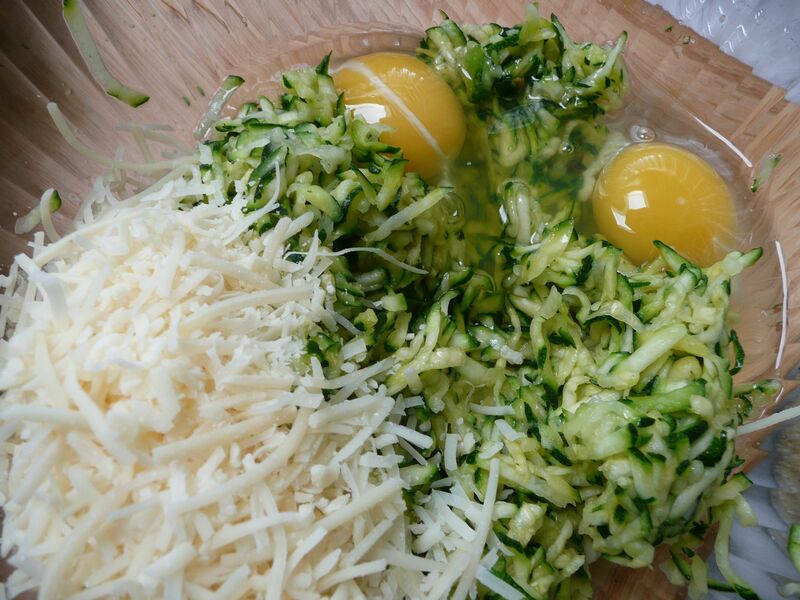 Mix with egg and grated cheese. 6. 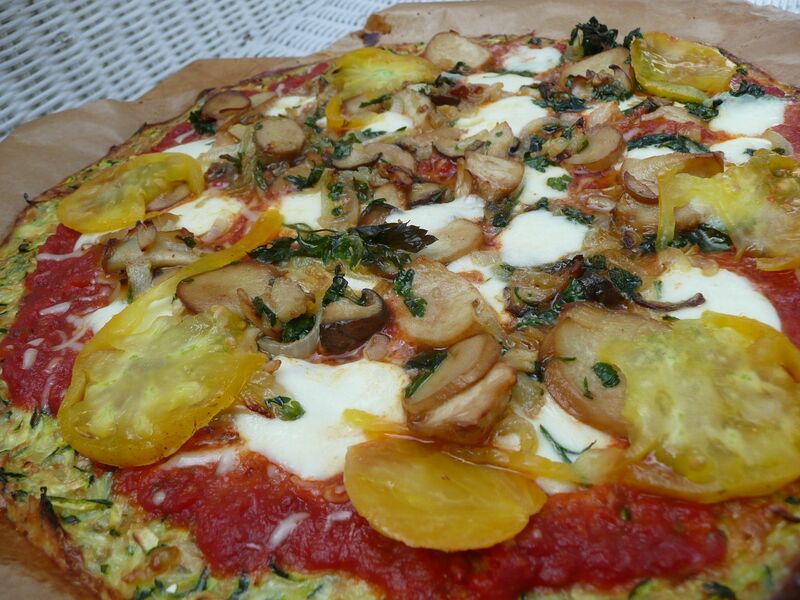 Spread parchment paper on a pizza stone or baking sheet. Spread out your dough batter about 1/2 inch thick into a circle. 7. Put it in the oven and cook until it has browned, about 15-20 minutes. Meanwhile, as it is cooking, sauté any toppings you want cooked. 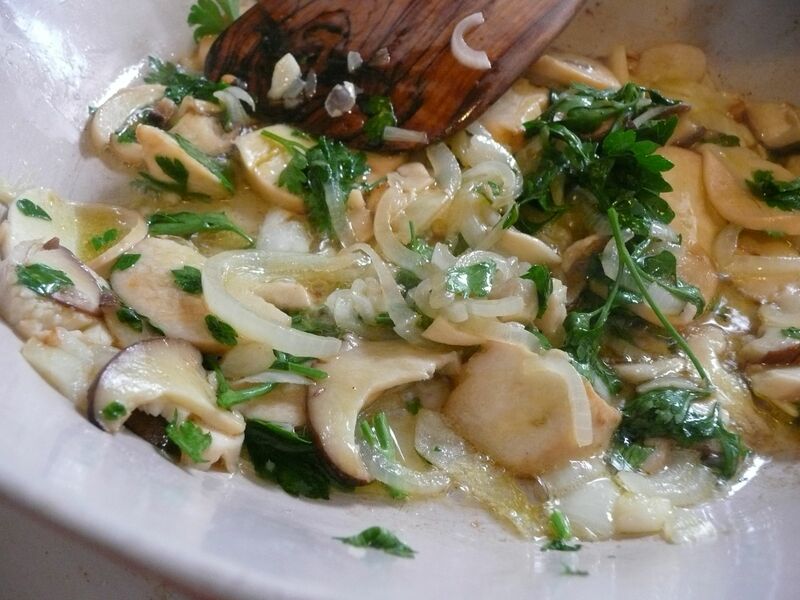 I sautéed garlic, onions, mushrooms and Italian parsley. 9. Take the browned bottom crust out of the oven and admire it. 10. Cover it with your toppings. 10. Bake again until crust edges brown further and cheese on top melts into toppings. 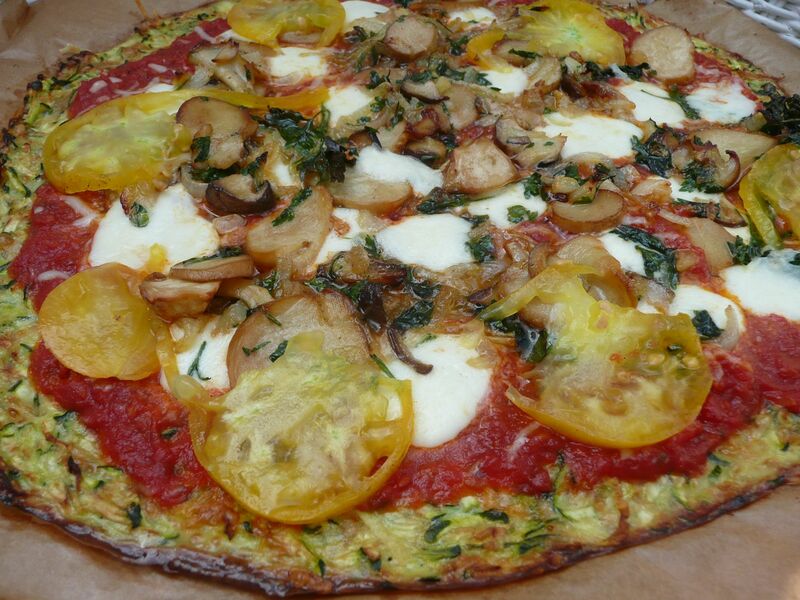 Take out of oven and add drizzled olive oil, grated black pepper, and optional fresh tomatoes and fresh basil. Serve hot. Rosh Hashanah and the holidays that follow mark the season of sweet foods. I don’t have much of a sweet tooth, and try to avoid sugar, but there is, as they say, a time and place for everything. This is the season for my grandmother’s plum cake. 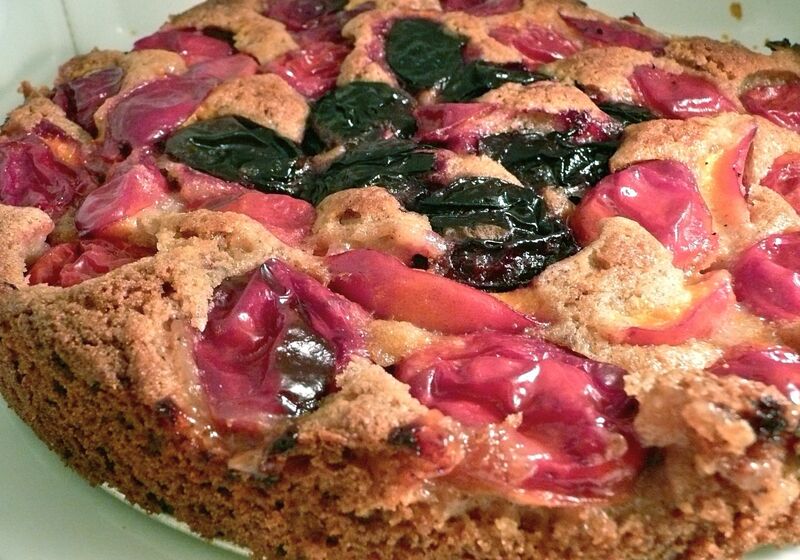 The first rule of this plum cake: Use more plums than you think is reasonable. The top should be covered entirely in plums that have been cut in half. And yes, you can use pluots or apriums or whatever color or flavor of plum you like. Just make sure they’re delicious. Edited to add: I just spoke to my grandmother and she says apricots are also marvelous in this recipe. You can even halve them, freeze them, and make this cake in winter. The original recipe calls for regular flour. I’ve made it gluten-free with a blend of rice flour and nut flour. It works great with either almond flour or hazelnut flour. The last two nights, I’ve used local hazelnut flour, probably my favorite baking ingredient (after butter). Make this to celebrate fall, to break fast on Yom Kippur, to eat on Sukkot, to sweeten Shabbat Shuva (tonight) or just to use up all those plums that have been attacking you from your plum tree (or the one down the block/in the park/in your friend’s yard). And when you eat it, wish sweet things, and strength and health this year, for my grandmother in return. 1 cup flours: I combine rice and hazelnut (or almond) in a proportion of either 1/2 cup of each or 3/4 cup rice to 1/4 cup nut. Fluff or sift. 1. Cream sugar and butter until light. 2. Add eggs, one at a time. Add vanilla and zest if using. 3. In a separate bowl, mix flours baking powder, and salt. Mix in gently but thoroughly. 4. Spoon the batter into a buttered 9-inch springform pan. 5. Cover the top entirely with the halved plums, skin side up. Sprinkle lightly with topping mixture and lemon juice. You can skip the topping too. 6. Bake at 350 degrees for about 1 hour. Remove and cool. Remove sides of spring form pan but leave cake on the bottom part. Refrigerate or freeze if desired, or cool to lukewarm and serve plain with vanilla ice cram or whipped cream (which Grandma prefers). To serve frozen torte, defrost and reheat briefly at 300 degrees.